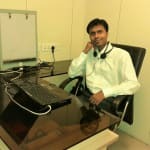 Dr. Deepak Dass is one of the best Homeopaths in Kolkata. He has had many happy patients in his 9 years of journey as a Homeopath. He has done BHMS. You can meet Dr. Deepak Dass personally at Holistic Clinic. Save your time and book an appointment online with Dr. Deepak Dass on Lybrate.com. Lybrate.com has a number of highly qualified Homeopaths in India. You will find Homeopaths with more than 44 years of experience on Lybrate.com. Find the best Homeopaths online in Kolkata. View the profile of medical specialists and their reviews from other patients to make an informed decision. I found the answers provided by the Dr. Deepak to be very helpful. Thnkyou doctor for your valuable advice..I was very troubled with the report..m a little bit relaxed now..
Dr. Deepak Dass provides answers that are very helpful, knowledgeable, caring and professional. okey i will send you feed back thanx doctor. Dr. Deepak provides answers that are very helpful, knowledgeable, well-reasoned, thorough and caring. Thank you so much for advising dr.
Dr. Deepak Dass provides answers that are inspiring and very helpful. Please tell about medicine. Internal and external. Dr. Deepak Dass provides answers that are very helpful and knowledgeable. Thank you Sir. It helped me a lot. I found the answers provided by the Dr. Deepak Dass to be very helpful. Thank you for the response. I found the answers provided by the Dr. Deepak Dass to be very helpful. Thank you doctor. Hello, I am 19 years old gal and have been struggling to sleep lately, I do feel sleepy but I have to toss and turn before I cud eventually sleep, please help me on what to do or eat. Dear sir/ma'am I am a student but as soon I come from my classes in the afternoon and try to take sleep I am not able to get sleep although I try hard and it spoils my whole day as I couldn't feel energetic for rest of the day? Can you pls help me out? My 2 year old switched to one percent milk and since then she has had eight or more bowel movements than normal and a lot of them are diarrhea. What is wrong? She is facing milk intolerance a kind of milk allergies she will be absolutely fine in few days of Homeopathic treatment. consult back with few more details about her health for same. I am suffering from various mind related issue it changes time to time right now I am dreaming a lot which makes me feel that my sleep is not completed. over thinking of any topics it is my constant problem anxiety also sometimes panik attacks too. Currently I am suffering from all these type of problems try to solve my problem dr. Yes you will be absolutely fine in few weeks treatment. consult back with details in private window. Sir, I am 39 year male. My bp sometimes 140/94. I consult a doctor he advice me DEPPLET medicine and some antacid. another doctor advice me TELVAS40. I daily going for morning walk 4 km. Occasional smoker and drinker. I am confused. I have diabetes and taking triglynase2. So I am confuse what to do! please help. I am a 5’11, 175 LB (+/- 40 LB in adult life), caucasian 24 year old male who has had persistent unconjugated hyperbilirubinemia that I have been aware of for the past six years, however, throughout my entire life I have been prone to excessive itchiness. I was 18, and in the military at the time when after I returned from a brief period of leave (vacation, I was drinking at the time) someone pointed out that I appeared jaundice. Within a few days I had liver function tests done as well as a full chemistry panel, and everything was normal with the exception of my indirect bilirubin being 1.9 mg/dl and the total bilirubin was <2.2 mg/dl. At the time I thought nothing of it, and over four years of military service never had any medical professional mention anything during routine checkups (Note: At age 21 I quit consuming alcohol and at age 22 I began consuming a vegan diet.) After being discharged from the military then at the age of 22 I again had a full chemistry panel done to include liver function tests (as a check up to see how I was doing after 6+ months of a vegan diet), and again everything was normal except for my indirect bilirubin which was 3.3 mg/dl with the total bilirubin being <3.6 mg/dl. About a year later at the age of 23 I had the same set of testing done, and again everything was normal except for my indirect bilirubin which was 2.0 mg/dl with the total being <2.3 mg/dl. Now at the age of 24 (Note: I do not have access to test records prior to this, but everything was within normal range aside from the indirect bilirubin which I made note of.) I again had the same set of tests done, and will list the results: BUN-7.0 mg/dl, Na 144.9 mmol/L, K 4.64 mmol/L, Cl 104.1 mmol/L, ECO2 28 mmol/L, AGAP 7.3 mmol/L, CA 8.87 mg/dl, TP 7 g/dl, ALB 4.48 g/dl, AST 24.8 U/L, ALT 32.1 U/L, AHDL 46 mg/dl, Total Bilirubin 4.12 mg/dl, Direct Bilirubin 0.214 mg/dl, Indirect Bilirubin 3.9 mg/dl, ALPI 62 U/L, TGL 119.3 mg/dl, ALDL 65 mg/dl, VB12 386 pg/ml, Iron 177.3 ug/dl (ate a lot of beans), VITD 17.9 ng/mL, CHOL 121.1 mg/dl, and CRE2 .62 mg/dl. Since this round of testing was much higher it has led me to be re-tested multiple times over the past 4 months since the previous test, and not much has changed. Re-test 1: BUN 5.1 mg/dl, Total Bilirubin 3.39 mg/dl, Indirect Bilirubin 3.12 mg/dl, Direct Bilirubin .271 mg/dl, VITD 13.4 ng/ml, and iron 98.9 ug/dl (reduced bean consumption by 75%), (Note: Had a full blood count everything was normal and my Lactate Dehydrogenase checked, LDI 189.7 U/L.) Re-test 2: BUN 6.6 mg/dl, Total Bilirubin 3.81 mg/d, Indirect Bilirubin 3.53 mg/dl, and Direct Bilirubin .275 mg/dl. I have no other symptoms that I can reliably say that are present other than jaundice (sometimes worse than others), itchiness, the occasional yellow-ish stool (which I have only recently been making note of, but am sure that I have experienced it before), weight loss/gain multiple times throughout my adult life (40 LB in 3-6 months), and the possible occasional slight discomfort in my upper right abdomen, the latter of which to be honest I am not entirely sure actually exists or is a result of paranoia (Note: I have regularly experienced pain in the area of my right shoulder blade throughout my life (sometimes worse than others or non-existent.) After writing it off for so many years I now find myself increasingly paranoid about my potential health to the point that it is affecting my quality of life. With all of that said, what do you think this could possibly be, and could this be serious? Thank you for your time. Well its quiet a chronic issue with you! Where there is will there is a way kindly detail me you present situation in life how has this affecting your day to day life and what impact you find because of these. Also forward all your reports for proper guidance and medication support. My 8 month baby vomits after each burp is it normal. He vomits the milk after burping. My 2 years old child is not sleep well. And very fussy for eating. Please tell me how to cure this problem asap. He will require to take a constitutional Homeopathic treatment for few weeks to resolve the issue. consult online with details. After eating pav bhaji now stomach pain and loose motion started, what to do now. I am suffering from diarrhea from few days. I have taken many medicines. Its happen mostly before periods starts. please tell me the solution.